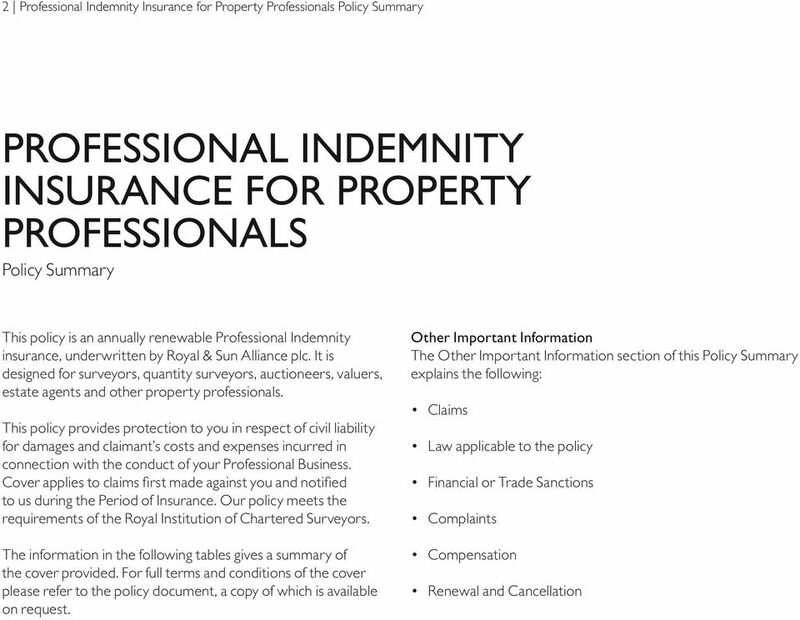 Download "PROFESSIONAL INDEMNITY INSURANCE FOR PROPERTY PROFESSIONALS. 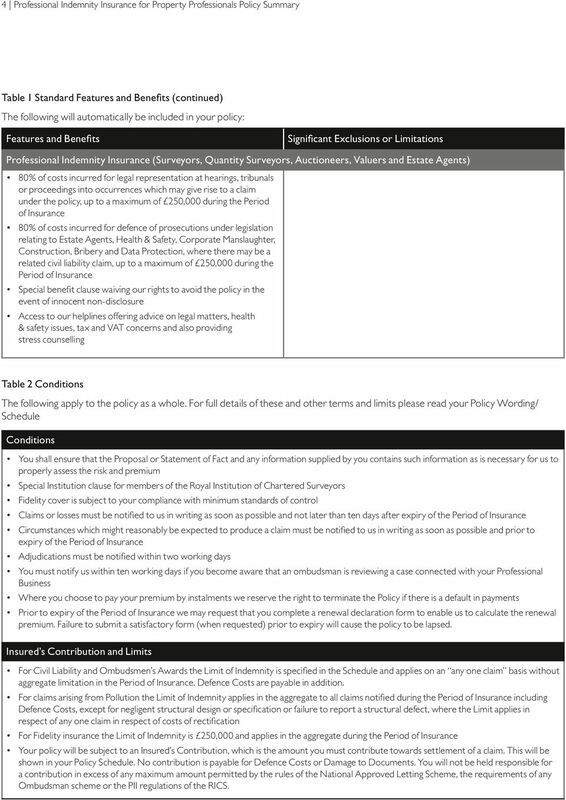 Policy Summary"
4 4 Professional Indemnity Insurance for Property Professionals Policy Summary Table 1 Standard Features and Benefts (continued) The following will automatically be included in your policy: Features and Benefts Signifcant Exclusions or Limitations Professional Indemnity Insurance (Surveyors, Quantity Surveyors, Auctioneers, Valuers and Estate Agents) 80% of costs incurred for legal representation at hearings, tribunals or proceedings into occurrences which may give rise to a claim under the policy, up to a maximum of 250,000 during the Period of Insurance 80% of costs incurred for defence of prosecutions under legislation relating to Estate Agents, Health & Safety, Corporate Manslaughter, Construction, Bribery and Data Protection, where there may be a related civil liability claim, up to a maximum of 250,000 during the Period of Insurance Special beneft clause waiving our rights to avoid the policy in the event of innocent non-disclosure Access to our helplines offering advice on legal matters, health & safety issues, tax and VAT concerns and also providing stress counselling Table 2 Conditions The following apply to the policy as a whole. For full details of these and other terms and limits please read your Policy Wording/ Schedule Conditions You shall ensure that the Proposal or Statement of Fact and any information supplied by you contains such information as is necessary for us to properly assess the risk and premium Special Institution clause for members of the Royal Institution of Chartered Surveyors Fidelity cover is subject to your compliance with minimum standards of control Claims or losses must be notifed to us in writing as soon as possible and not later than ten days after expiry of the Period of Insurance Circumstances which might reasonably be expected to produce a claim must be notifed to us in writing as soon as possible and prior to expiry of the Period of Insurance Adjudications must be notifed within two working days You must notify us within ten working days if you become aware that an ombudsman is reviewing a case connected with your Professional Business Where you choose to pay your premium by instalments we reserve the right to terminate the Policy if there is a default in payments Prior to expiry of the Period of Insurance we may request that you complete a renewal declaration form to enable us to calculate the renewal premium. Failure to submit a satisfactory form (when requested) prior to expiry will cause the policy to be lapsed. Insured s Contribution and Limits For Civil Liability and Ombudsmen s Awards the Limit of Indemnity is specifed in the Schedule and applies on an any one claim basis without aggregate limitation in the Period of Insurance. Defence Costs are payable in addition. For claims arising from Pollution the Limit of Indemnity applies in the aggregate to all claims notifed during the Period of Insurance including Defence Costs, except for negligent structural design or specifcation or failure to report a structural defect, where the Limit applies in respect of any one claim in respect of costs of rectifcation For Fidelity insurance the Limit of Indemnity is 250,000 and applies in the aggregate during the Period of Insurance Your policy will be subject to an Insured s Contribution, which is the amount you must contribute towards settlement of a claim. This will be shown in your Policy Schedule. No contribution is payable for Defence Costs or Damage to Documents. 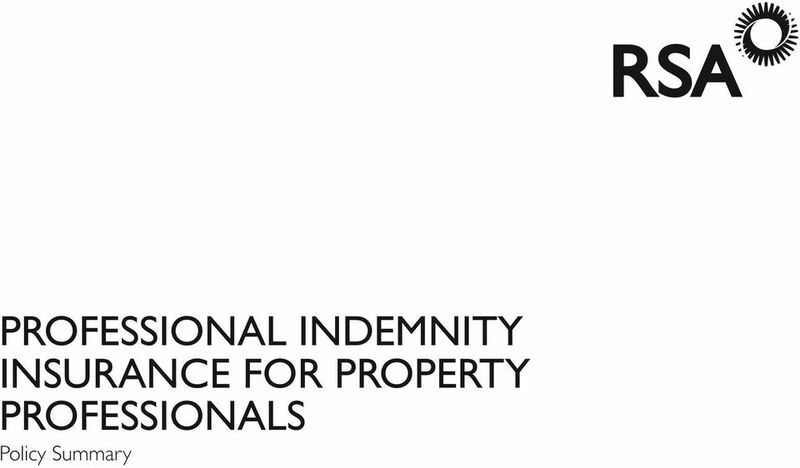 You will not be held responsible for a contribution in excess of any maximum amount permitted by the rules of the National Approved Letting Scheme, the requirements of any Ombudsman scheme or the PII regulations of the RICS. 5 Professional Indemnity Insurance for Property Professionals Policy Summary 5 OTHER IMPORTANT INFORMATION Claims Should you wish to make a claim under your policy please call our claims helpline on as soon as possible. You must give us any information or help that we may reasonably ask for. You must not settle, reject, negotiate or agree to pay any claim without our written permission. 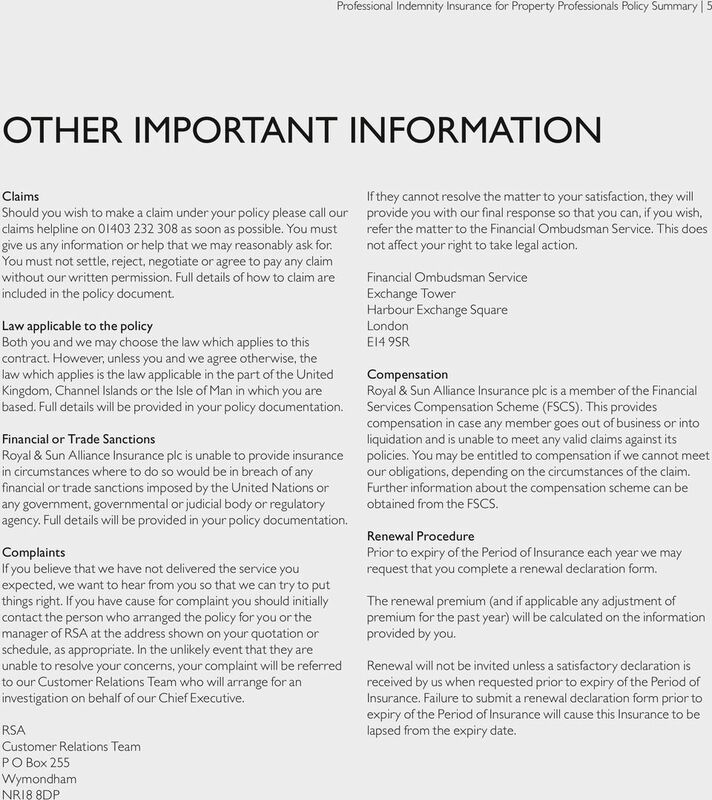 Full details of how to claim are included in the policy document. Law applicable to the policy Both you and we may choose the law which applies to this contract. However, unless you and we agree otherwise, the law which applies is the law applicable in the part of the United Kingdom, Channel Islands or the Isle of Man in which you are based. Full details will be provided in your policy documentation. Financial or Trade Sanctions Royal & Sun Alliance Insurance plc is unable to provide insurance in circumstances where to do so would be in breach of any fnancial or trade sanctions imposed by the United Nations or any government, governmental or judicial body or regulatory agency. Full details will be provided in your policy documentation. Complaints If you believe that we have not delivered the service you expected, we want to hear from you so that we can try to put things right. If you have cause for complaint you should initially contact the person who arranged the policy for you or the manager of RSA at the address shown on your quotation or schedule, as appropriate. In the unlikely event that they are unable to resolve your concerns, your complaint will be referred to our Customer Relations Team who will arrange for an investigation on behalf of our Chief Executive. RSA Customer Relations Team P O Box 255 Wymondham NR18 8DP If they cannot resolve the matter to your satisfaction, they will provide you with our fnal response so that you can, if you wish, refer the matter to the Financial Ombudsman Service. This does not affect your right to take legal action. Financial Ombudsman Service Exchange Tower Harbour Exchange Square London E14 9SR Compensation Royal & Sun Alliance Insurance plc is a member of the Financial Services Compensation Scheme (FSCS). This provides compensation in case any member goes out of business or into liquidation and is unable to meet any valid claims against its policies. You may be entitled to compensation if we cannot meet our obligations, depending on the circumstances of the claim. Further information about the compensation scheme can be obtained from the FSCS. Renewal Procedure Prior to expiry of the Period of Insurance each year we may request that you complete a renewal declaration form. The renewal premium (and if applicable any adjustment of premium for the past year) will be calculated on the information provided by you. Renewal will not be invited unless a satisfactory declaration is received by us when requested prior to expiry of the Period of Insurance. Failure to submit a renewal declaration form prior to expiry of the Period of Insurance will cause this Insurance to be lapsed from the expiry date. 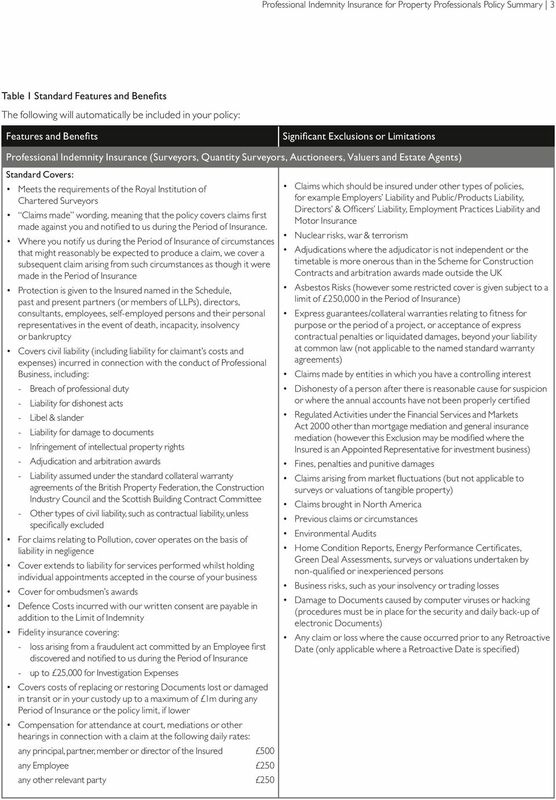 Business Insurance Professional indemnity section only Summary of cover About this document This document is a summary of the insurance and does not contain the full terms and conditions of your insurance. Hiscox Professional Indemnity Insurance for IT Consultants and Suppliers What is a? This document provides key information about Hiscox Professional Indemnity (PI) Insurance for IT consultants and suppliers. Home Insurance Policy Summary Page 1 Just the cover you need Home Insurance Thanks for choosing ASDA Home Insurance. It s a good feeling when you know the things you really value are protected, isn t it? Taxwise Premier Protection Important: This is a claims made insurance, which means we must receive claims during the period of insurance. Home Insurance. Your Home Emergency policy summary.